The air tears and mends itself back together. Crawling out from sleep, I peek between curtains . . .
Mist so thick the mountains and lake have vanished. Only the nearest firs anchor me. the picture window continues to vibrate. before the next giant surge. faded by dense gray air. This poem fist appeared in Poetry Bay. Mark Thalman lives in Forest Grove, Oregon, where he has taught 7th grade English for thirty years. His poetry has been widely published in small presses, college reviews, anthologies, and e-zines for the last three decades. His book, Catching the Limit, was published by Bedbug Press - Fairweather Books as part of their Northwest Poetry Series. Mark has served as a Poet-in-the-Schools for the Oregon Arts Commission, Assistant Poetry Editor for theNorthwest Review, and board member of the Portland Poetry Festival. He is also an artist who enjoys painting wildlife scenes with acrylics. To learn more about Mark, visit www.markthalman.com. 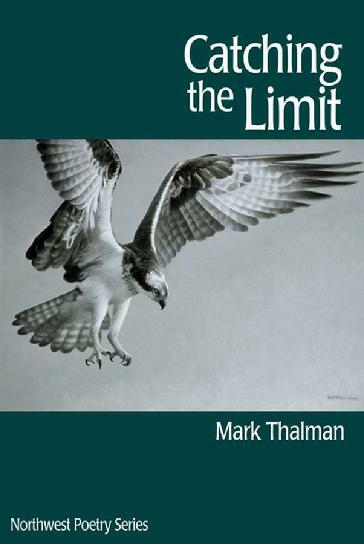 To purchase Catching the Limit, click on the book cover and contact Mark via his email address. I can take a thunderstorm if I am on the inside listening, listening on solid ground. I have always loved a thunderstorm, the way it makes me feel alive. This poem captures the feeling i get when the thunder shakes the house and the lightning cracks across the sky and the rain comes in torrents. Thank you Mark. I continue to follow you wherever you are. Love the first line. We are immediately drawn into the poem. Fun. Makes me want to close all the windows and double-bolt the door.